Is the Sr9 Bridge the same age? How about the summit bridge? No. Route 9 bridge was built in 1968, 26 years after the St. Georges Bridge. Summit Bridge is also newer than St. Georges...built in 1960. If they close the St.Georges bridge, that will cause traffic on the 1 to double, just like they said. Second, traffic volume on the St. Georges Bridge is just over 11K. Volume on the Route 1 bridge is around 90K. Even if all of the St. Georges traffic shifted to the Route 1 bridge, that is not even close to a "doubling of traffic". Your right I exaggerated the number, but with the amount of new neighborhoods being built including the 3 NEW ONES around the bridge & the 301 opening. Traffic could definitely be doubled in maybe 5-10 years. & the timing of the other two bridges built is not that far off, seems like those bridges will have 25 years max before they will have to be rehabbed like the current St.Georges bridge is. If volumes doubled, there would be a helluva lot more traffic issues than just adding a lane on the bridge. Ok yall are right, so I assume yall dont see the traffic doubling anytime soon, even with all the new construction. With all the traffic being pushed onto the 1 I assume traffic levels are going to go up in due time. What else would have to be added if traffic was doubled? Still, at 90K AADT, 8 lanes is a reasonable consideration. Add another 11K and it becomes an issue with peak period congestion. So they'll need to address this long-term unless they rebuild 13. They are rebuilding the 1/13 merge soon (Idk how long till then) but I noticed De-1 around middletown & up to tybouts corner is pretty crazy in the morning and evening rush. De-1 needed 4 lanes 3 years ago. I wonder when they will be adding the extra lane all the way up to the NB Route 7. I keep hoping that the 301 connector to Summit Bridge will relieve some traffic from SR 1, but I'm not sure of that. Well, with the interchange upgrades planned on DE 896 at I-95 and US 40, the spur road may make it a real contender for a DE 1 relief route. (Something something turned tables...) It's a limited access surface expressway between the bridge and I-95 and could still easily be upgraded to a full freeway, especially south of US 40. They could make it a long-term strategy like DE 1 south of Dover, one interchange at a time. On a related note, did we ever figure out what's up with the seemingly misaligned southbound lanes adjusting south of Glasgow? I remember it being brought up a while ago on this forum, but can't remember if we reached any conclusion. Surveying error, they just poured the concrete in the wrong place, im shocked that police dont sit there and wait for people to speed by, Im glad they dont tho. and they have the interchange upgrades planned, but what are they gonna do with the Old cooches bridge road across from 4 seasons, the Glasgow high road and old baltimore pike road, thats either 3 more interchanges or they will be cutting those roads off and redirecting the traffic elsewhere. I don't know and I'm sure they don't have immediate plans. I'm just saying it's comparatively easier to upgrade 896 than, say, US 13 between Tybouts Corner and I-295 or DE 141 between DE 2 and US 202. 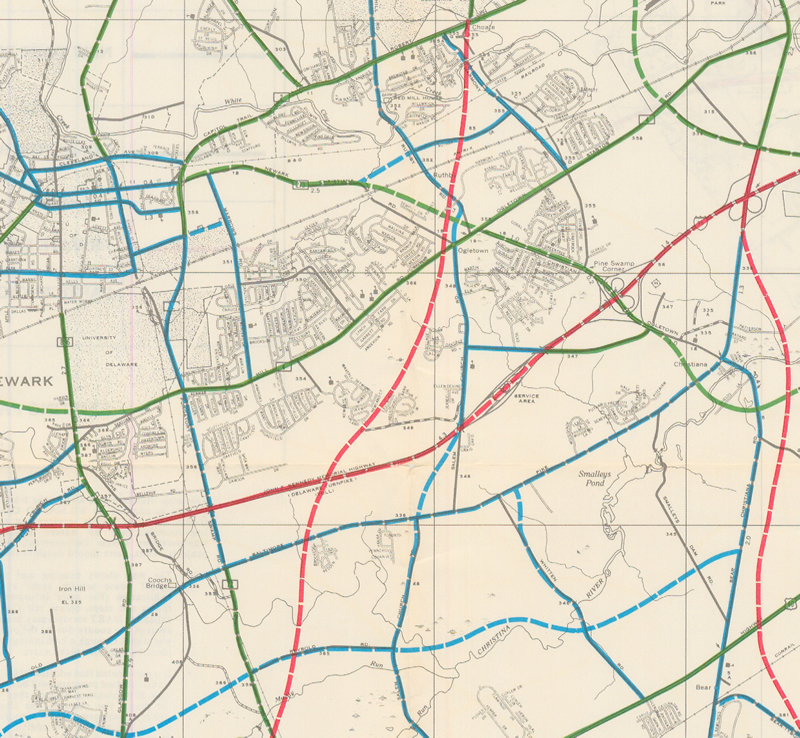 Last time we brought it up the ideas of a simple misalignment or it being remnants of aborted freeway plans were kicked around. Alex had posted a couple maps on page 20 for the "Pike Creek Expressway" proposal for US 301 that sort of lined up with the pavement misalignment, but no conclusion was ever reached. So yeaa what could have caused this? If a truck was in an accident right where that sign was, something could've popped up that hit the sign. Or a truck's PTO system may have been on and caused the body of the truck to rise, hitting the truck. Those signs are at minimum 15 or 16 feet above the roadway, so it's not just an ordinary or even normal oversized truck that would've hit it, because they would've hit things before this sign as well. 1. Will this sign be simply repaired or completely replaced? 2. Will one of the two remedies/remediation take place at all? I ask question #2 due to this example along I-95 near Burlington, MA. Such has been damaged since 2013-2014(?) and was still that way as of this past Christmas when I last drove through there. I though of another reason if this happened very recently: A plow truck had its body up for the salt and smacked it. I thought of that because I've seen that happen in NJ several times. This sign had been hit: https://goo.gl/maps/jtqEZDMa4JK2 . I think only the portion of the sign that was hit was replaced, but you can't tell, especially in the picture. The only evidence though you can see: Take a look at the catwalk in front of it: The left side is shinier, and there's no lights. The right side still has lights (I doubt they're used though). Another example is this one: https://goo.gl/maps/yctYKrLw7WN2 . In this case, the catwalk was hit and never replaced, but the truck managed to miss the sign somehow. I've seen traffic lights hit as well. Those things shatter into a thousand pieces! LOL They're replaced rather easily though. The Plow idea is most likely what happened, I cant imagine anything else hitting the sign, other then a dump truck with its back up, but in videos where that happens, the whole sign gets nearly ripped off. 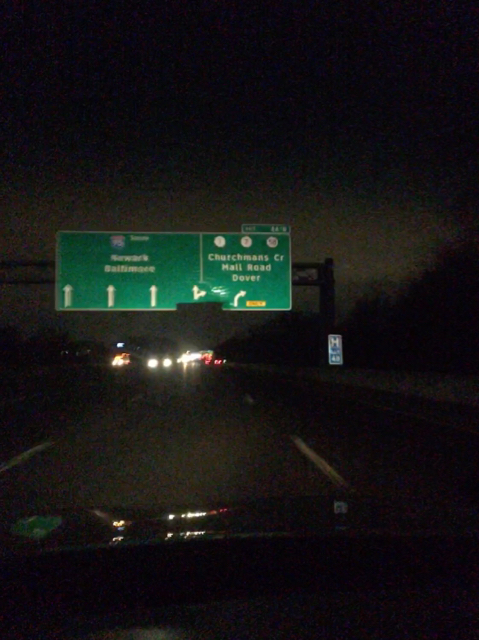 It will probably be a while before they replace that sign, there are other signs that have been hit, that Deldot hasn’t replaced. People are pretty mad about this upcoming project, Main street needs to be upgraded. But Deldot should definitely not add more meters during construction on different streets to continue getting their money. I wish planners back in the day would have made mainstreet & the City of Newark a lot bigger, so much more could have been in Newark. Where do you read that DelDOT is adding meters on city-owned streets, or that DelDOT gets the money from the City of Newark parking meters? DelDOT isn't adding the meters. That's Newark that wants to knock down the buildings and put the meters in. Of course, as some commenters already pointed out, why add meters in? Why not make parking free? They claim the construction is going to hurt the shops and restaurants along the street, yet in the same breathe they talk about making shoppers pay to park. They say that many shops won't survive. Looking at the history of Main Street, how would you be able to tell? The turnover is so great there's a constant rotation of new businesses already. As far as the construction goes, unfortunately it's probably needed. They question why doesn't Deldot wait until the summer because of move out. Well...what about move in? Its going to affect them too, for two years. They can't just delay the project forever. There were many times at UD when I'd be biking to the university and Main Street was just a disaster as a bicyclist because of all the potholes. I'm surprised I never crashed there (I did crash once on College Avenue though, but that was my fault). If Newark wants meters added wouldnt they just make Deldot install them? Or do they use another company? 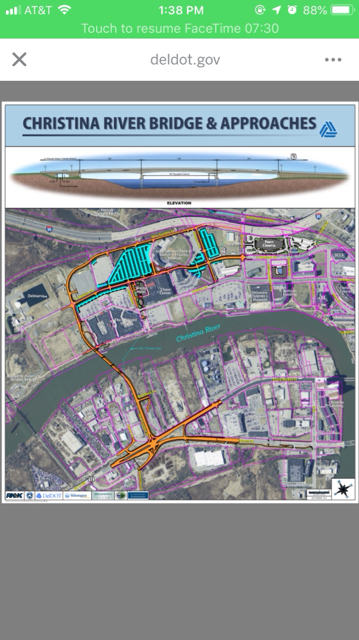 Looks like a new NB 95 Ramp will be built according to this graphic. ^ I looked at the full graphic. It does not show a new ramp to 95. What you're confusing for a new ramp is in reality planned as connecting New Sweeden St to Beech St underneath the I-95 Viaduct. Are you sure froggie? Look again, you can see a orange ramp going up to 95, I see the dotted road under the viaduct. Edit: Froggie is correct, my eyes fooled me for a sec.